There have been a number of memorable football teams to grace the fields behind John F. Kennedy High School, but the group that will go down first in the school record books is the team that went from third place in the conference standings to 2018 State Champions. "It feels like a dream," sophomore Isaiah Basargin said. "We never thought we'd get here. Coaches told us we're not supposed to be here, but we worked our butts off." Two months after the Trojans recorded their first loss of the season 44-0 at the hands of the Wolverines, Kennedy took its revenge on the biggest stage. 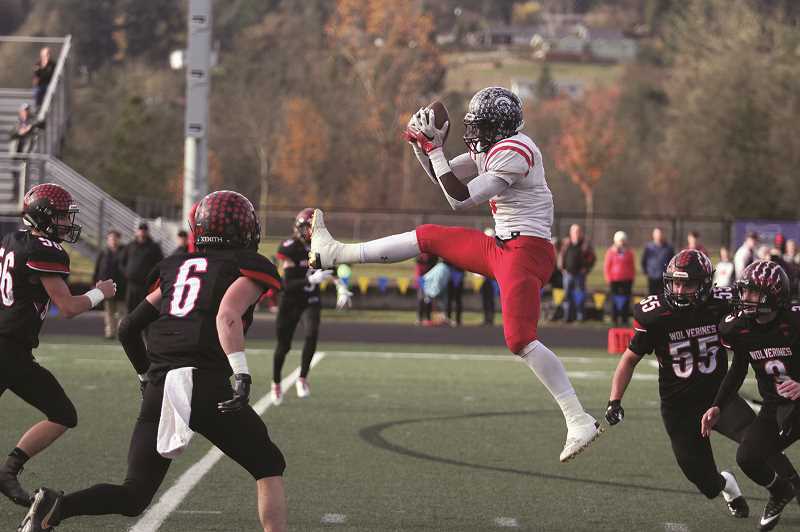 The Trojans quickly established themselves as the superior team in the title game, picking apart the Santiam defense while swallowing up every drive by the Wolverines to take a 28-0 lead at the half. Junior running back Emorej Lynk was at the epicenter of the team's first-half dominance, beginning with the team's game-opening touchdown when Lynk broke free along the right side for a 56-yard touchdown. 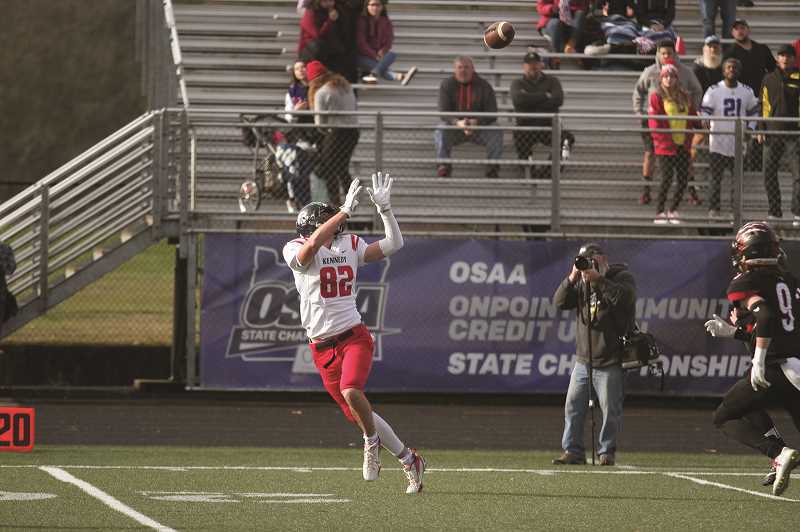 After the Trojans halted Santiam's ensuing drive on the second play on a fumble forced by David Reyes and recovered by Bryce Vandervort, it was Lynk who touched the ball on five straight plays, including a 17-yard catch over the middle on third and long to keep the drive alive. Two plays later, Vandervort swept wide to the left for the Trojans' second touchdown to make it 14-0. Another stalled Santiam drive led to another Kennedy touchdown drive led by Lynk, who completed a halfback pass to Rocco Carley for a 45-yard touchdown to give the Trojans a 21-0 lead just eight seconds into the second quarter. Lynk added one more touchdown for good measure on a two-yard dive with 4:34 left in the quarter to bring the Trojans to their halftime lead. "First half, we just kept the momentum," junior Sam GrosJacques said. "That was the main thing in this game was keeping the momentum." But Lynk's big day came to an end on the final play of the first half, after suffering an injury to his right knee that kept him on crutches for the remainder of the game, putting a damper on an otherwise exhilarating first half for the Trojans. It was enough of an opening for Santiam, who opened the second half with its first sustained offensive drive of the game, leading to a one-yard touchdown by Trevor Tinney to make it 28-6 after failing the two-point conversion. Kennedy's offense stalled on its opening drive, and Tinney took his next carry 91 yards for the touchdown to cut the Trojans lead to 28-14. The Trojans weren't done yet, though. Kennedy started its next drive near midfield and slowly drove down the field to set up Bruce Beyer for a 21-yard field goal to make it 31-14. The drive gave Kennedy a much-needed three-score cushion while eating more than five minutes off the clock, putting Santiam in a time crunch to score quickly. "Having Emorej out in the second half kind of slowed us down stopping the run, but we still did a pretty decent job," GrosJacques said. "It was a big loss, but it didn't shut us down completely." 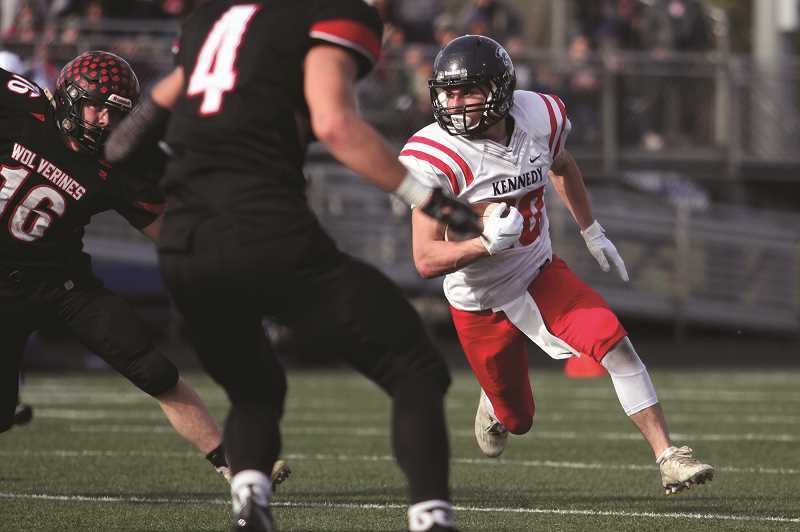 The Wolverines' next drive ended early on an interception by Beyer, and after three straight runs plays by the Trojans, Santiam started anew with five minutes left. The team was able to put together the touchdown drive it needed, completing a 14-yard pass to Trevor Whitmire to make it 31-20, but the Kennedy defense prevented the two-point conversion and the Trojans went on to run out the remaining time to bring Mount Angel fans a long-coveted football title. "The first time our school winning is pretty awesome," GrosJacques said. "It's a piece of history." Following the game, Lynk was named Player of the Game, despite sitting out the final 24 minutes of play. The junior led the team with 18 carries for 143 yards and two touchdowns, completed a 45-yard touchdown pass to Carley and had one catch for 17 yards. GrosJacques and Ruben Ramirez led the team with 10 tackles each. Tinney led all players with 210 rushing yards and two touchdowns. 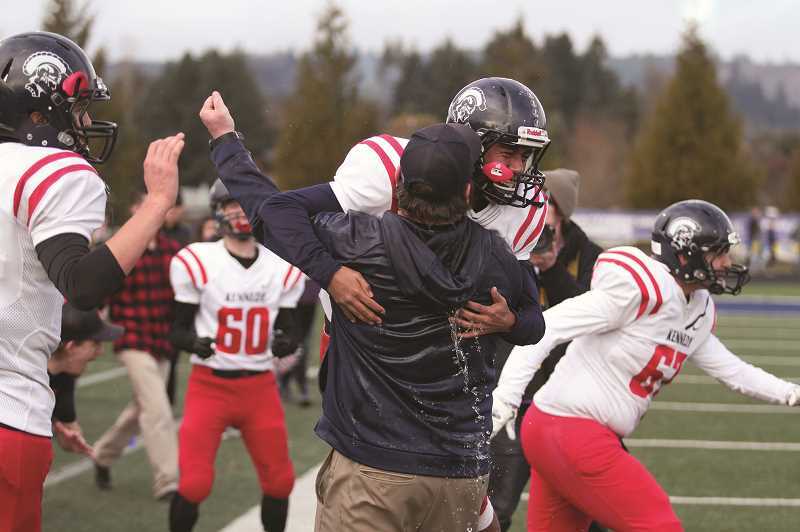 Saturday's championship win was the ninth consecutive victory of the season, a streak that began following back-to-back blowout losses in September to Santiam and Sheridan. After starting the season with two big non-conference wins, the Trojans were looking at an 0-2 record in league play that all but guaranteed the team was out of the running for a league title. "The beginning of the season we had doubters," Basargin said. "The first loss we had against Sheridan, we used that as motivation to get better. We had doubters telling us we're not going to get to the playoffs, but we just took that in and every day in practice we just worked our butts off." Rather than break the Trojans, those losses laid out a blueprint for how much better the team needed to be if it wanted to accomplish its goal at the end of the season. Kennedy won its next game, defeating Grant Union 37-0 in its final non-conference tilt. The Trojans then proceeded to win out the regular season to finish third in the Special District 2 standings and secure an at-large berth to the playoffs as the No. 10-seed. Kennedy opened the postseason with a 34-0 route of Heppner on the road before taking down league champion Sheridan in the quarterfinals. A 23-16 win over Lost River put JFK in the football championship game for the fifth time ever, and the rest is history. "It's a crazy feeling to know that you're the start of something new for the school, the community and our families," Basargin said.